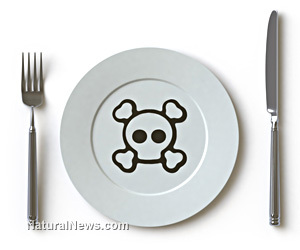 Are you eating bug poison and weed killer daily? (NaturalNews) Most people who don't tune into Natural News eat bug and weed killer every day, maybe even every meal of their lives. Many Americans, namely one in every three or more, get cancer and can't figure out why. Their doctors won't tell them the truth, and they just can't believe that it came from the food they ate, but 90% of the time, it does. Since the early 1990's, Americans have been secretly fed bug and weed killer in their fruits and vegetables, and in their cereals, bagels, chips, oils and bread. Most innocent folks who don't spend any time doing research on what they put in their mouths think that if they take their fruit and vegetables home and wash them off, or cook them well, that they are getting rid of toxins and they don't have much to worry about. On top of all of that, most consumers love their meat and dairy, and wouldn't quit it for the world, but they don't realize that the hormones in most conventional meat and milk are overwhelming their bodies, leading to the development of tumors and cancer cells, which is just more fuel for the bug and weed killer they eat with every meal, causing inflammation and breaking down their immune and central nervous system. (http://www.infowars.com) The animals most Americans feast on are fed bug and weed killer food all day, including alfalfa, corn, soy, and even candy. That is what causes the massive digestive illnesses during the animals' lives, and this is exactly why they give them so many antibiotics. Add in horrific disease breeding conditions and you compound the toxic "meat and milk" health nightmare. This is standard in the USA on the big farms that are owned, manipulated, operated and turned into CAFO-style nightmares run by Monsanto, Dow Chemical, Syngenta, Bayer and more "Big Ag" Biotech dirty giants. Almost all processed foods and refined sugars come from GMO corn, which is now deadly in America. Most processed foods also contain GM soy and GM canola, which are also deadly. Let's talk bluntly here: Eating Monsanto food causes cancer. Have you ever smelled bug killer, like ant or roach spray? Have you ever smelled RoundUp weed killer? GMO means food contains bug killer and/or weed killer, did you know? You can't wash it off. And what does bug killer do? Bug killer kills the bugs from the inside out, by dissolving their digestive system. It's like acid to the bugs. The big death cover up is upon us. The biggest cancer nightmare, food which changes your DNA by inserting DNA from insects, mixed with chemicals of all sorts, including herbicide and insecticides, which form in the human stomach and eat you alive from the inside out, just like a bug. This breeds SUPER INSECTS in your gut also known as PARASITES.